When you say 4th of July- we say ICE CREAM! This decadent ice cream recipe takes 1 hour to prepare, then freezes over night and voila, you have a recipe that’s perfect for this festive time of year! Prepare an ice water bath by filling a bowl halfway with ice and water: set aside. Combine cream, milk, Rodelle Vanilla Bean pod, and sugar in a large saucepan. Bring to a simmer over medium heat, stirring occasionally until the sugar dissolves, about 5 minutes. In a large bowl, whisk the egg yolks until foamy in color, about 3 minutes. Remove the cream mixture from the heat and remove the vanilla pod from the pan. Slowly pour about 1 cup into the egg yolks, whisking continually. Pour the cream-egg mixture back into the pan and cook over medium heat, stirring constantly, until the custard coats the pack of a spoon, about 5 minutes. Whisk in the scraped vanilla seeds. When you draw your finger across the spoon, it should leave a line through the custard without filling back in. Remove the custard from the heat and strain into a large, heat-proof bowl. Stir in the Rodelle Gourmet Vanilla Extract and place mixture over the ice water bath to chill, about 10-15 minutes. Refrigerate overnight. Combine the strawberries, water, and sugar in a medium saucepan and bring to a boil. Reduce the heat and simmer for until sauce thickens, stirring often, about 5 – 8 minutes. Use a potato masher or fork to smoosh the strawberries as well. The mixture is hot, so use caution. The mixture should be just slightly chunky. Remove from heat, let cool, then refrigerate until ready to incorporate into the ice cream. Preheat oven to 325°F. Spray the cups of a 12 cup cake tin with vegetable oil, or line with baking cups. Soften the butter. Sift the flour, baking powder, and salt together in a medium bowl and set aside. In a mixer bowl, cream the butter until light and lump-free. Add the sugar until light and fluffy. Add the eggs, one at a time, scraping down the sides of the bowl frequently and mixing well after each addition. Stir in the Rodelle Vanilla Extract and lemon peel. Fold in the dry ingredients by hand in 3 stages. Fill the cups about ¾ full. Bake until golden brown and springy to the touch, about 40 – 50 minutes. You will use 2 cupcakes for the ice cream. Freeze the rest, or drizzle with our Chocolate Syrup and a daub of our Vanilla Bean Whipped Cream. Cut 2 cupcakes into ½ inch cubes. 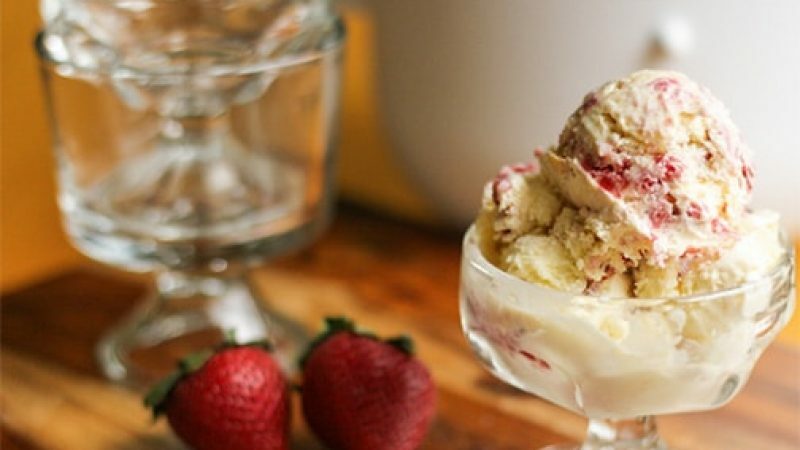 Freeze the cream mixture in an ice cream maker until soft-serve consistency. Add the strawberries and mix until swirly, so you can see the vanilla ice cream and swirls of strawberries. Gently fold in the cupcake pieces.